A goat in the garden: The simple life?? 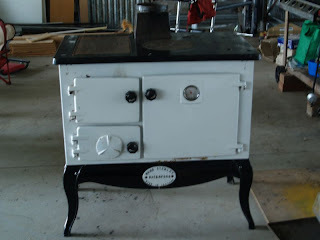 We have finally put together our Stanley Traditional combustion stove. Here he is in all his glory! Its been quite the learning experience! And I can say, that if we buy another combustion stove I think I would much prefer to get one that is in one piece. That said, we now really understand how it works, so that is not a bad thing. The stove will be our main cooking stove, we will have the BBQ and possibly a mudbrick pizza oven (if we ever get time to do fun stuff like make mudbricks). The stove will also be our water heater, and hopefully will also keep us warm, when we make the shift, hopefully sometime early 2009. Now we are waiting on getting our kitchen, which will probably be pulled out of its current home in the next few weeks, and we will be able to put the stove in its final position. I really really can't wait to use it, but that is still a while away, as we haven't got a flue or the hot water stuff to hook it all up, but at least I can now 'pretend' to use it! Its funny, whilst most people seem to be trying to find ways to make things 'easier' or quicker we are choosing the opposite. Which reminds me of a program we happened to see on TV one night. It was about these rich british people who went over to Africa, to 'help' the locals. They had to come up with some idea to improve the lives of the people there or something along those lines. One of the guys was an older man, who although wasn't obese, wasn't quite the picture of health and vitality. He was horrified at how these people had to carry their water up the hill in containers every day and wanted to set up pumps etc for them. He tried to carry the water up the hill once, and I think he nearly had a heart attack. Now, I realise he is probably meaning well, but these people (and it was often the children's job to fetch water) where incredibly fit and agile, and for them it wasn't so much of a chore as just part of life. Makes me think why is it that us westerners seem to think that our incredibly lazy lifestyle (and I include us in this too, I don't think we personally are any better than anyone else - but we are trying to make concious decisions to change) is something that the rest of the world should follow. Everything we do is EASY really, turn the tap and there is water, flick the switch and we have lights, turn the knob and there is our 'fire' to cook on. Heck, we don't even have to wash our plates or hang out our washing any more! And then we can buy stuff that we can simply throw out when we have finished with it, rather than re use it. As a whole we are lazy and disgusting! It really scares me to think that we are trying to 'help' others become fat and lazy like us. We need to get out there and get back to basics, rather than always trying to find the EASY way to do things, why not do things the hard way. Hard work is actually good for us, and keeps our body from falling apart. Anyway, my rant is over! Have been madly spinning lately, determined to finish my last alpaca fleece before the baby arrives. Due date is officially tomorrow. Hoping that I may still get the next weekend before I will return to the walking dead, but we will see. No photos of spinning since I don't think white alpaca yarn is exciting enough to show over and over, although it is lovely and soft. I'm thinking of making myself a cardigan out of it. 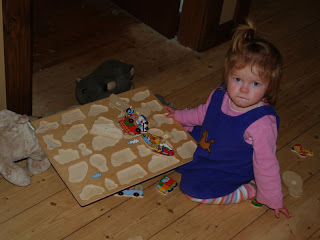 So I will leave you with a picture of the little one, she has just started to really get into the wooden puzzles, does them over and over and over. I agree with your rant too.